STAR WARS R2-D2™ ANA JET is in Singapore! Fans of Star Wars, here's a piece of fantastic news for you! 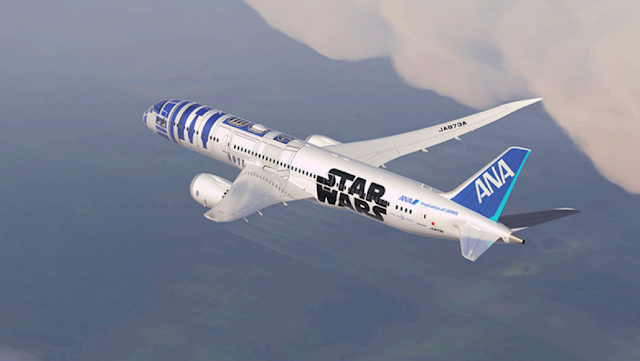 The largest plane airline, All Nippon Airways (ANA) is the first in the world to announce a Star Wars inspired R2-D2™ ANA JET which will touch down in Singapore in November! You too can stand a chance to experience this flight together with other amazing treats that are in store for you! 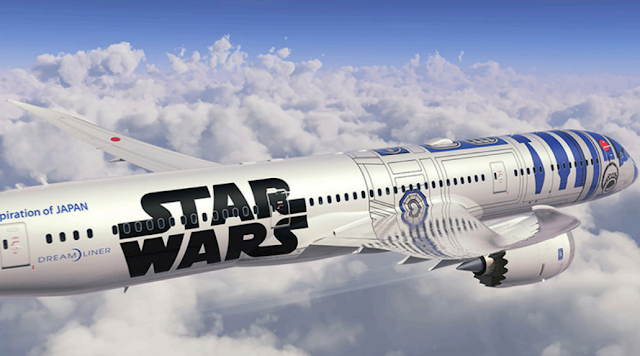 I don't know about you, but I sure as hell am excited to witness the unveiling of a Star Wars inspired jet, and on a 5-star airline? Well just shut up and take my money already. If you don't already know, ANA Jet is Japan's only 5-star airline. Having travelled to 39 countries even to USA, it is ranked the 15th airline on global charts. ANA is also known for their hospitality and politeness in their services, striving to bring passengers on board an experience which they will truly remember. In conjunction with this, ANA is now giving 15 lucky passengers a pair of tickets to be the first in Singapore to step on board this plane on 14th November! Other than that, here are some of the highlights that you can look forward to enjoying if you do win! 1. Winners will enjoy watching one of the currently released STAR WARS movies with an in-flight business class meal on the full flat business class seat, while submerging themselves in the STAR WARS interior such as STAR WARS themed headrests and dining ware. Sounds amazing? Now here's how you can participate! fill in your details, and await the good news!! Tag the friend which you will be bringing on my Instagram post @cforcassan! For those who aren't selected, well, don't fret as ANA will also be choosing 50 lucky winners to walk away with a R2-D2™ ANA JET exclusive model plane! - The campaign is only open to participants residing in Singapore. - Winners of Prize B will be chosen from entrants who did not win Prize A. - All winners will be notified by email. - Prize B will be sent to the winner’s designated address at end of November. - Delivery of the prize is limited to a valid address in Singapore only. - On the event day, winners will be entitled to enter Singapore Changi Airport restricted access area. Some restrictions for hand carry bags or other conditions may apply within premises. - Full terms and conditions will be sent directly to the winners by email. - R2-D2™ANA JET is parked on the ground at all times during the event. - All time and schedule mentioned in this campaign are based on Singapore Time. - Lucasfilm and The Walt Disney Company (Japan) Ltd. are not sponsors of the Campaign. - Lucasfilm and The Walt Disney Company (Japan) Ltd. are exempt from any and all legal liability related to the Campaign. Hurry on and sign up now, and you may be one of the lucky winners!